This Place of Worship was founded in 1864, but we understand it was closed in 1898, and the premises are now in secular use. An account of Nonconformity in Bolsover, on the Victoria County History website (in 2014, then "Work in Progress") indicates that Primitive Methodism was introduced to Bolsover in 1819 by Jeremiah Gilbert. He was arrested for his pains; but afterwards meetings were held in a cottage in Hockley. This is information that the compilers obtained from a book Bolsover Methodist Church. Centenary Celebrations 1896-1996 (M. Clarke, 1995). A permanent Chapel was not, however opened until 1864, and this was closed for Methodist worship in 1898, when the congregation moved to new premises in Welbeck Road. The building was then taken over by the Salvation Army, who occupied it until 1911, after which time it was converted into Council Offices. The plaque on the exterior of the building now reads: 'Bolsover Urban District Council' '1911', so unfortunately, it retains little of its original provenance. The Salvation Army Hall afterwards moved to another location, for which there is a separate entry in this database. 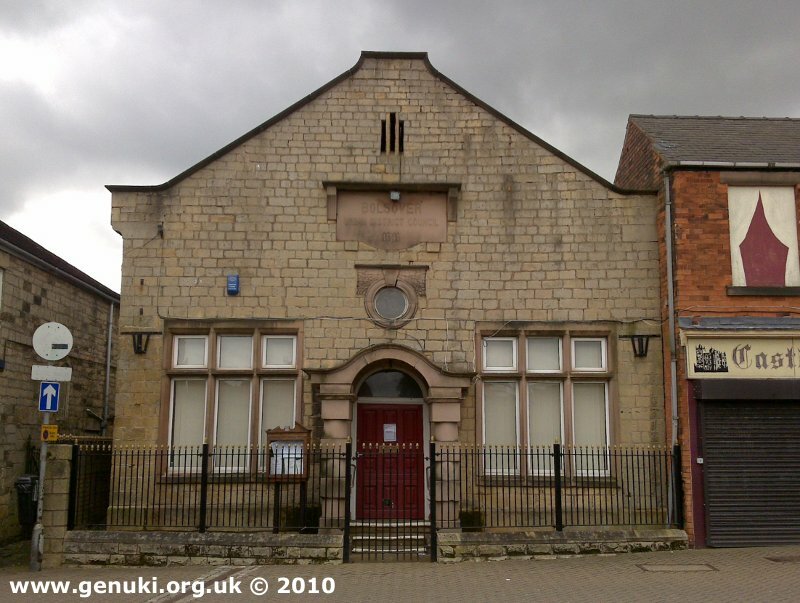 Primitive Methodist Chapel (replaced by Town End Methodist), Bolsover shown on a Google Map. Information last updated on 21 Nov 2014 at 15:22. Please also remember that the former Primitive Methodist Chapel (replaced by Town End Methodist) is understood to be in secular use, so care should be taken to preserve the privacy of its occupants. This Report was created 29 Mar 2019 - 23:15:55 GMT from information held in the Derbyshire section of the Places of Worship Database. This was last updated on 6 Feb 2019 at 15:49.